The used Hyundai Veloster is a compact hatchback that offers major appeal with its sporty design, features-rich cabin, and fuel-efficient ride. Its unique three-door design is unlike anything else in this segment, and it gives passengers easy access to the rear seats. Tech junkies will love the Veloster cabin, which is handsomely equipped with modern infotainment options. It's a solid pick for used buyers, offering all the latest safety gear and extremely competitive fuel economy. 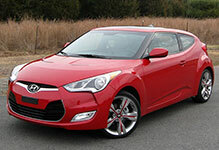 Check out our guide to the used Hyundai Veloster to learn more. When you're shopping for a used Hyundai Veloster, you'll find lots to like. These stylish hatchbacks provide spacious accommodations for four passengers. The Veloster stands apart from the competition with its three-door body style. On the passenger side, there are two doors, offering quick access to rear seats. The driver side has only one door, giving the Veloster a coupe-like appearance. In addition to attractive, comfortable interior space, the Veloster cabin speaks to your need for cutting-edge tech features. All models are well equipped to help you safely maintain your smartphone addiction while on the go. Use the Bluetooth connection to stream your favorite audio apps. Pandora Internet radio treats you to endless music options. The Veloster's Blue Link telematics system lets you make outbound text messages and share your location on Facebook. The system also includes turn-by-turn navigation, so you'll never wonder if you're taking the best possible route. This stylish hatchback provides the most in passenger safety. In government crash tests, first-generation used Veloster models earned a perfect five-star rating for overall protection. The Insurance Institute for Highway Safety gave the Veloster its top score of "Good." With the Blue Link telematics system, the Veloster can help you problem-solve from the road. Features like automatic collision notification and roadside assistance come in handy when you need them most. Blue Link also comes in handy if you're the type who can't remember whether you've locked the car - the remote locking feature solves that problem in a jiffy. The geo-fencing feature alerts parents when young drivers have traveled out-of-bounds. All Veloster hatchbacks come with a rearview camera, which makes it easy to spot any objects that you'd rather not back into. The Veloster's sporty appearance goes hand-in-hand with its powertrain options. With the turbocharged engine, you'll have access to 201 horsepower - more than enough to get you going on the highway or surpass slower traffic. The six-speed manual transmission adds to the Veloster's fun-to-drive nature. If manual gearshifts aren't your thing, look for the Veloster's traditional six-speed automatic, which is known for its smooth, refined performance. Finally, the Veloster offers a unique six-speed automated manual transmission, known as the DCT, which combines the best of both worlds.